I hadn’t had filled pasta since Venice, and for the first couple of weeks, I couldn’t get enough tortellini with pesto! Here, tortellini is usually in the neighborhood of $6/pack and it often has chicken (kylling) or ham (skinke) in it, so 10 kr meat free tortellini was quite a find! But as time went on, I got sick of tortellini with pesto, and so I had to find other ways to use up my tortellini supply. 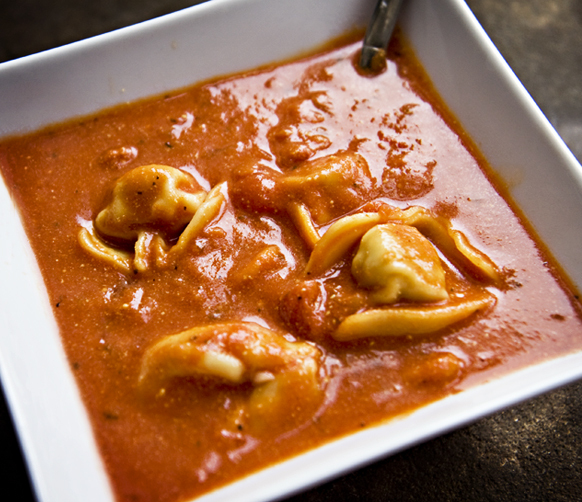 I’m a sucker for a good soup, so here you have my new favorite soup, and my new favorite way to eat tortellini! This recipe makes several liters of soup, so use a large pot! Sauté the onion in a bit of olive oil until it softens, then add the garlic and sauté it a few more minutes. Purée one of the cans of tomatoes, and add it along with the sugar, paprika, basil, veggie stock, milk, tomato paste, and the remaining 2 cans of tomatoes. Stir it until it’s well blended. Simmer it for 20 minutes, then stir in the Parmesan and tortellini, and simmer it for another 15 – 20 minutes, or until the tortellini are cooked. Season it to taste with salt and pepper, and it’s done! This soup has broken up the monotony of the Great Tortellini Supply, but it’s also been very economical. What used to be two meals per package has easily become 4 – 5, and a lunch I look forward to! It’s also delicious with the addition of minestrone-inspired veggies… green beans, spinach, carrots, etc. * One thing I love about Denmark is that even in winter, fresh herbs are sold in pots at very reasonable prices in nearly every grocery store. I know that not everyone is as fortunate, so in a pinch, I’d use 2 – 3 t dried basil. What a great use for tortellini! Will have to give it a try. So glad you found such a great price on the tortellini! This looks so good. I’ve been making a lot of soup lately. Good thing today is shopping day and I can pick up the few missing ingredients.